We Fallbrookians woke up to a lovely light rain this morning, sorely needed. It has kept up for much of the day. I have been sick with a cold all weekend but sucked it up and made it to work this morning. It gets on my wife's nerves if I am around all of the time and I thought I would spare her some aggravation. Should mention that she made me soup, tea, waited on me hand and foot all weekend. How long can anybody keep that up? As I left I inspected my palm garden and saw this beautiful flower underneath my butia capitata palm. I used to be really involved with epiphytic cactus and I would plant segments of them in this large pindo palm for some reason. Anyway this flower is a beauty, they have been going off all week. Approximately 16 to 20" wide, guess I should measure it, an explosion of color on a dreary rainy day. 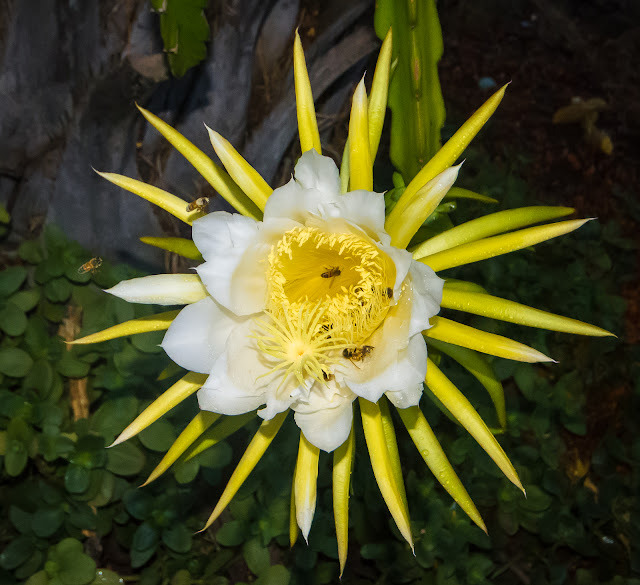 Hylocereus Undatus is more commonly known as the night blooming cereus. In Hawaii is it known as panini o kapunahou or Punahou cactus. Other names are flor de caliz, junco, thanh long, pitahaya, dragon fruit, strawberry pear, belle of the night, cinderella plant and Jesus in the cradle. No one knows exactly where the species originated but it is thought to be the americas. Aren't these magnificent? I have one plant and I've attempted to pollinate the blossoms by hand. There are a couple of commercial dragon fruit growers in Fallbrook as you probably know. Low water requirements and good prices for the fruit make them an attractive alternative to avocados.